Extinction has previously been regarded as a process that is inherent in the theory of evolution and occurs over geological time scales due to “natural selection”. However, since humans have themselves now become a major selective force, extinction is no longer a phenomenon of the distant past. Starting around 50,000 years ago, a huge wave of extinctions has swept through Australia, the Americas, Eurasia, and many of the world's islands and wiped out most of the large mammal, bird, and reptile species, collectively referred to as the megafauna (typically heavier than about 40 kg). While this time period has been associated with dramatic worldwide climatic changes, humans often seem to have catalysed extinction events, with the relative contributions of humans and climate change to the collapse of a species depending in each case on local specificities. A large majority of megafaunal species had already become extinct by the end of the last ice age (about 12,000 years ago), coinciding with the Pleistocene-Holocene transition. Exactly when a species vanished is in most cases impossible to date. Fossilization is a very rare event in the first place, and only a small proportion of fossil or subfossil remains are actually found. It is therefore extremely unlikely that the remains of the very last specimens of a species would even be preserved, let alone recovered. A species that is in decline will typically continue to linger on for a while in some remote pockets of its original habitat, forming what are known as relict populations. A crucial concept here is that of an “extinction window”, which refers to the time period between the last confirmed record of a species and its ultimate demise with the death of the last individual. Extinction windows for species are estimated on the basis of parameters such as body size, the area and climate of its habitat, and the geology and topography of its terrain. We now know that extinction windows are sometimes significantly longer than previously thought; mammoths, for instance, survived on a remote island in the Arctic Ocean until just 4,000 years ago. On Madagascar, some species of megafauna including elephant birds, giant lemurs, and dwarf hippos are known to have survived at least until 500 – 1,000 years ago. In view of the remoteness of the karst regions of the western interior of this huge island, which remained inaccessible even long after European colonization, there is speculation that the extinction window of some of these most charismatic island species extended well into the modern period, and possibly even into the 20th century. 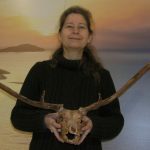 Alexandra van der Geer provides an intriguing account of the late survival of the Malagasy megafauna. Madagascar, sometimes known as "the red island", is the world’s fourth-largest island and home to an unusually large number of unique plants and animals. This is thanks to its tropical climate, its enormous size (almost 600,000 square kilometers), and its isolated location (about 400 km east of the African mainland). Madagascar first came into existence as a separate land mass during the gradual break-up of the Gondwana supercontinent, between about 160 and 80 million years ago. India was the last major fragment to become detached from Madagascar, some 80 million years ago. The coastlines of south-eastern Africa, Madagascar, and western India still reflect how individual pieces of the Gondwanan jigsaw puzzle once fitted together. An old baobab tree in the Tsimanampetsotsa National Park. Madagascar is known for its unique biodiversity, with numerous endemic plants and animals. 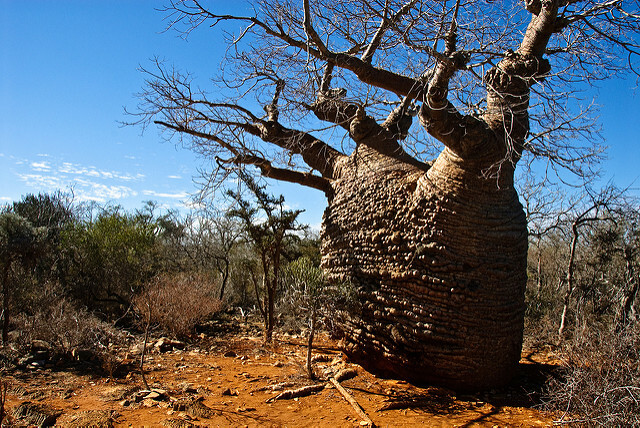 The six species of Baobab trees (Adansonia) are typically found in the arid western part of the country. The Tsimanampetsotsa National Park is located in the southwest of the island and protects significant expanses of native spiny forest (Image credit: groucho, flickr). Madagascar's subsequent isolation has largely protected it from mammalian invasions since that time, except for a lucky few who somehow managed to arrive, presumably assisted by ocean currents, and establish themselves: lemurs (50-60 million years ago), tenrecs (25-42 million years ago), fossas (19-26 million years ago), and Malagasy mice (20-24 million years ago). These different groups of mammals appear to have arrived several millions of years apart, rather than all at the same time . A small-bodied nocturnal lemur that probably weighed less than 1 kg was the first mammalian species to arrive, reaching Madagascar about 10 to 25 million years ahead of the others. Over many millions of years its descendants then gradually adapted to the various habitats that their new homeland had to offer while, over the same period of time, Madagascar's climate became wetter and increasingly monsoonal, due to the steady drift of the mega-island towards equatorial latitudes and the influence that the continuous uplift of the Himalayan mountains had on the development of the monsoon season. Like the Darwin finches of the Galápagos, the lemurs thus evolved and diversified until their diversity eventually became one of the most impressive within the order of the primates, to which we also belong. The diet of present-day lemurs varies between the species, from tough leaves for the indri (Indri indri) and young bamboo sprouts for the bamboo lemurs (Hapalemur), to tree-dwelling insects and grubs for the aye-aye (Daubentonia madagascariensis). The lightest present-day lemur is Madame Berthe's mouse lemur (Microcebus berthae), which at 30 grams is the world's smallest primate. In contrast, the heaviest lemur, the indri, is about 250 times heavier, weighing between 7 and 10 kg. The diversity of lemurs was greater in the past - much greater. Where Africa has its gorillas and Borneo and Sumatra their orang-utans, Madagascar had its giant sloth lemurs (Archaeoindris fontoynonti), which weighed up to 244 kg and were the size of male gorillas. This wasn’t the only large-bodied species that evolved from a small-bodied ancestor, in good accordance with the "island rule" of biogeography. There were also the slow-moving koala lemurs (Megaladapis, 46-85 kilo), the arboreal suspensory sloth lemurs (Palaeopropithecus, 41-46 kg and Babakotia, 20 kg), and the baboon lemurs (Hadropithecus and Archaeolemur, 15-35 kg). Artist’s depiction of the largest of the extinct giant lemurs, Archaeoindris (left), and the sloth lemur Palaeopropithecus (Image credit: Roman Uchytel, prehistoric-fauna.com). Competing with mammals in the heavyweight class was the 3 m high elephant bird (Aepyornis maximus), which at 400 kg was the heaviest bird ever to have existed. 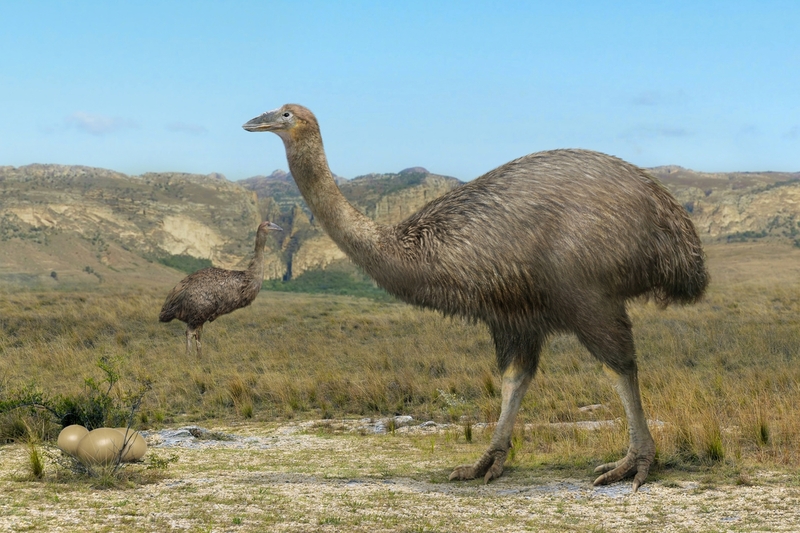 It belonged to the diverse group of ratite birds and, like its closest living relatives the ostrich, the emu, the cassowary, the rhea and the kiwi (yes, the kiwi! ), the giant bird of Madagascar was a flightless bird. Judging by the abundance of egg shells found in the southern dunes, a colonial nesting site for the giant birds, it had no competitors to fear and was able to thrive as a result. Artist’s depiction of the extinct elephant bird (Aepyornis maximus). An elephant bird egg weighed up to 10 kg and had a volume about 160 times that of a chicken egg (Image credit: Roman Uchytel, prehistoric-fauna.com). One or two million years ago the last megaherbivore appeared on the scene. During the Pleistocene, a herd of hippopotami somehow managed to cross the strait that separates the island from Africa (perhaps made possible by lower sea levels during the ice-ages). These hippos evolved into a smaller size on the island (about 380 kg, which is about a quarter of the size of the mainland form), an evolutionary trend that provides further support for the island rule. Two species were present, Hippopotamus lemerlei and H. madagascariensis, with the second being more terrestrial than the first. Skeleton of a Malagasy dwarf hippo (Hippopotamus madagascariensis), shown at the same scale as a skull of a common African hippo (H. amphibius) (Image credit: Public Domain). These were the main megafauna of the red island. But where are the giant lemurs, elephant birds, and dwarf hippos today? What went wrong? We don’t exactly know. A number of hypotheses have been proposed to explain their disappearance, mostly blaming habitat loss, overhunting, the impact of introduced species, or disease following the first human settlement (which occurred when Austronesian people from the Sunda Islands arrived in outrigger canoes some 2,500 years ago). Cut marks on lemur bones (dated to 530-300 BCE) and dwarf hippo bones (about 300 BCE or older) are eagerly accepted as evidence of the latter. After all, a similar scenario has been demonstrated for the extinct moas of New Zealand. These giant birds were ratites like the elephant bird, with one species being even taller than the elephant bird, albeit not as heavy (about 230 kg). When Polynesians settled New Zealand around 1,300 CE, these giants were driven to extinction in less than a century by mass hunting, together with habitat alteration (due to slash-and-burn techniques), soon to be followed by the largest eagle the world has ever seen (Haast's eagle: Harpagornis moorei), which was left with no prey to hunt. Rapid extinction events such as these are known as blitzkrieg scenarios (literally: lightning war scenarios). However, scenarios such as those for the moas, the dodo, the Falkland wolf, and other unfortunate islanders do not seem to apply to Madagascar. Subfossil remains of the giant lemurs have been radiocarbon-dated to as recently as 1,320 CE and 1,500 CE, while subfossil remains of dwarf hippos and egg shells of the elephant bird have been dated to about 1,000 years CE . These extinction dates imply that parts of the Malagasy megafauna coexisted with humans for at least 1,500 to 2,000 years, which is significantly longer than the moas survived with humans in New Zealand. A recent extinction date is also indicated by the prominence of large animals in local folklore. One of the megafauna species, the sloth lemur Palaeopropithecus ingens, may figure in Malagasy legends as the tretretretre. Another animal that figures prominently in Malagasy folklore is the vorompatra, the marsh bird, which is thought to correspond to the elephant bird. This species may have made it into the 17th century, based on stories of sightings by locals recorded in 1658 by the French governor Étienne de Flacourt who, in his Histoire de la grande isle de Madagascar, wrote about “a large bird that lives in the Ampatres [a region of southern Madagascar], lays eggs like an ostrich and is in fact a kind of ostrich; inhabitants of the above-mentioned area are unable to catch it, it seeks the most remote places” (adapted from Buffetaut E, 2013). When the French naturalist Alfred Grandidier (1836 – 1921) traveled to the island he also picked up rumours about the forest-dwelling song'aomby, literally a "cow that isn’t a cow", which was described as an animal with a cow’s body but lacking horns or cloven hoofs. Eager to set eyes on this strange animal he ventured inland where he came across a swamp filled with thousands of bones of dwarf hippos and elephant birds, in excellent states of preservation. But the bones were all that he found of the cow that wasn't a cow. Was he simply unlucky? Accounts by native people claimed that dwarf hippos, known as kilopilopitsofy in their own language, were still around in the 20th century in a remote region in the south-western part of the island. What appear to have been giant lemurs (known locally as kidoky) are also claimed to have been spotted in the same region shortly before the 1990s, but no hard evidence for their continued existence has been presented . The advent of modern dating techniques has led to renewed interest in the early accounts by de Flacourt, Grandidier and others. The apparently recent extinction dates point to what is known as a sitzkrieg scenario (literally, a sitting war) rather than a blitzkrieg, especially when we bear in mind that the youngest absolute date is extremely unlikely to coincide exactly with the last occurrence of a species. Towards the end of a species' existence its population is likely to become increasingly fragmented, with relict populations persisting in remote areas until the very last individuals die without leaving any offspring. The time span between the youngest date and this eventual extinction is termed an extinction window. With dates as young as 1500 or perhaps even 1600 CE, the extinction window may easily have lasted until Flacourt's time or later, and kilopilopitsofy and kidoky may have been the last survivors of Madagascar's megafauna. This prolonged survival compared to other island faunas is likely to be due to the vast area of Madagascar, with parts of the rugged, karstic interior remaining largely undisturbed until quite recently. In 2014 a team led by Alfie Rosenberger and Laurie Godfrey of CUNY's Brooklyn College discovered a large number of subfossil remains of giant lemurs and other extinct species in a flooded limestone cave in the Tsimanampetsotsa National Park of south-western Madagascar. The remains have not yet been dated but the quality of preservation is extraordinary. These animals were most likely washed underground by flash floods and accumulated over time within the cave (Video credit: National Geographic). The combined evidence suggests that all mammalian species heavier than 10 kg gradually disappeared forever from Madagascar’s fauna list. Such megafaunal extinction is not restricted to Madagascar but is a typical feature of the ongoing extinctions worldwide that began about 50,000 years ago. Irrespective of the pace of extinction (blitzkrieg or sitzkrieg), with the heavy species long gone one can speculate about who will be next.